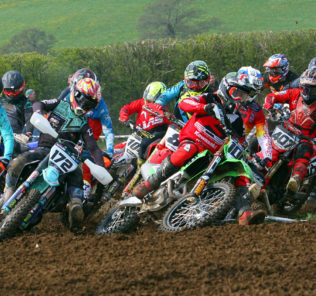 After such a long break due to unpredictable and atrocious weather, Portsmouth Motocross Club finally put on a great meeting at the perfectly prepped Grittenham circuit, just outside Royal Wootton Bassett. Despite arctic conditions, the sun was shining, and the racing throughout the day certainly warmed everyone up. MX2 were first out, and despite a couple of interruptions with the red flag waving, Charlie Razzell stayed totally focused and annihilated the rest of the field, taking home three comfortable wins and the overall. It was close for the runner up spot but Luke Kennett did just enough, going 2-3-2 to bag second place. A crash in the opening moto denied Tallon Aspden taking a top three spot but he fought hard with Lewis King London all day, but it was to be London who eventually took third overall away with him. MX1 followed soon after. Groans at signing on to see Adam Chatfield’s name on the signing on sheet, and Adam showed them why. Leading from start to finish in all races, he comfortably romped home with a hat-trick of wins to take the overall. Brad Wheeler and George Purchase went head to head in pursuit. Wheeler had the upper hand in the opening races keeping Purchase at bay, but race three saw Purchase sneak into second place from the drop of the gate. Despite his effort Wheeler took second sport with Purchase in third. With nearly every gate filled, the big wheeled 85 boys and girls took centre stage next. It looked like Max Brazier was going to take away another overall victory, battling hard all day with Oliver Ruddock, taking both opening race wins. A disastrous crash in race three denied his run and left him out of the top three. Ruddock continued his hot pace around the circuit, and securing the last race win also secured the overall. Louie Smith wasn’t far behind, and kept the leading duo in his sights. Going 3-4-2 he secured second overall ahead of Tom Parker-Butler. Bike issues for Parker-Butler left him riding his spare bike but it didn’t stop his speed and going 4-3-4 he secured third overall. In the smaller wheeled class, Ashton Phillips and Harlow Green both vied for the first place title, but Phillips had the extra pace to secure all three race wins. After leading the race, Green still kept on the leaders heels and comfortably came home in second in all three to finish runner up. Tyler Kirby didn’t let the top two get too far ahead of him, and settled into third spot, going 3-3-4. Another great turn out in the Junior 65 class, with Fabian Junior Morrison and Alfie Payne battling hard all day to claim top spot. Morrison took the opening two races with ease, despite a hard challenge from Payne, but a shortened third race left Payne taking the glory, with Morrison following behind. Morrison still stole the top prize with Payne in second overall. Mitchell Woodward was looking good for an easy top three, but going a bit off course in race one, he had to work his way back into fifth place. Redeeming himself in the closing races, he secured two third places and took home third overall. The mighty Marley Alder was unstoppable in the Auto 50 class, leading from start to finish, and putting in a flawless performance all day, he secured all three race wins and the overall. Jack Dugmore was on fire, not putting a wheel wrong all day, and comfortably romped home in second place in all three motos to secure second overall. A scrap between a handful of riders ensued, but it was to be Toby Bond who stuck his neck out a bit further, improving his results throughout the day, going 5-4-3 to take home third overall. Action was non-stop courtesy of a well-stacked Rookies class, with any of the top five riders looking to hit the top spot. 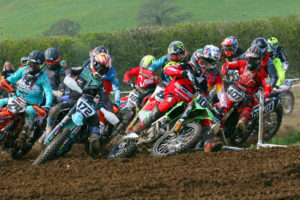 Despite leading each moto, Travis Reynolds couldn’t withstand the barrage of attacks from Thomas Casbeard who rode superbly, and at a blistering pace stole away all three race wins and the overall. Reynolds stayed focused and stayed ahead of his rivals, going 3-2-2 to take second overall. Liam Brosnan continued to be at the top of his game, fighting hard and riding fast to keep in contention of a race win. Going 4-3-3 he secured third overall. Last to go were the “old boys”, the VMX. Riding like he was 15 again, Brian Wheeler “wheelie” put on a great show, leading from start to finish, even having time to showboat across the finish line each moto as he crossed it in first place. The overall was his on the day. Paul Whillians was set to take a comfortable second overall but a no-show in race three allowed Tony Tunnell to take over. Keeping hot on the leading duos heels, Tunnell ended the day in second going 3-3-2. Despite slipping down the pack, Mark Morris was still a force to be reckoned with, not giving any of his rivals an inch of the track, and going 4-4-5 he secured third overall. VMX: 1 Brian Wheeler, 2 Tony Tunnell, 3 Mark Morris, 4 Tony Hale, 5 Neil Grant, 6 Brook Alder. MX2: 1 Charlie Razzell, 2 Luke Kennett, 3 Lewis King London, 4 Tallon Aspden, 5 Tom Shutler, 6 Joe Blundell. MX1: 1 Adam Chatfield, 2 Brad Wheeler, 3 George Purchase, 4 Jordan Carrier, 5 Andrew Walker, 6 Danny Jones. Rookies: 1 Thomas Casbeard, 2 Travis Reynolds, 3 Liam Brosnan, 4 Jesse Wren, 5 Domonic Newbury, 6 Jack Milsted. BW85: 1 Oliver Ruddock, 2 Louie Smith, 3 Tom Parker-Butler, 4 Brook Jenner, 5 Aidan Brooks, 6 Max Brazier. SW85: 1 Ashton Phillips, 2 Harlow Green, 3 Tyler Kirby, 4 Connor Williams, 5 Ashton Somerville, 6 Kieran Paget. 65s: 1 Fabian Junior Morrison, 2 Alfie Payne, 3 Mitchell Woodward, 4 Casey Kennett, 5 Jacob Collins, 6 Blu Kinch. Autos: 1 Marley Alder, 2 Jack Dugmore, 3 Toby Bond, 4 Archie Stapley, 5 Luca Tatchell, 6 Ezra Fagan.